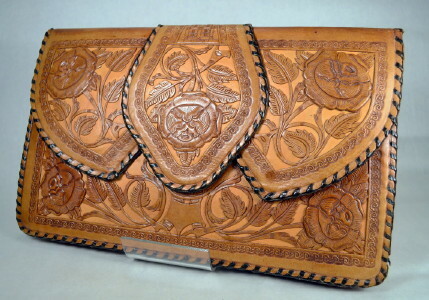 40's vintage hand tooled envelope clutch handbag. Golden brown leather and dark brown suede. Rectangular clutch with sculpted double flap and elaborate tooling inside and out. Sculpted outside pocket and strap back side. Black leather lacings at all sides. Pleated gussets. Wallet, mirror & frame pocket and coin purse attached at under flaps. Separate card fold & coin purse at interior pockets. Center zipper pocket. Zipper pocket at interior side. Brown suede facing at two flaps and back interior side. A marvel in intricate leather tooling! Good condition. Shows age discolor at front side, surface wear and broken lacings at flap fold. It's not perfect, but it is an extraordinary specimen of fine leather tooling.